This Pesto Pasta with Grilled Chicken is an easy and delicious weeknight meal. 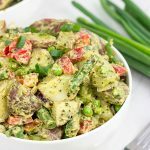 Serve it cold as a summer pasta salad or hot as a delicious winter entree! What was your favorite summer activity? Mine was swimming. We lived in Charleston, SC, and we’d hit the beach at least once a week. To be honest, though, I always preferred swimming in pools. The ocean water was murky, and you’d occasionally see jellyfish and other things out there with which you didn’t want to become close friends. My uncle had the best pool ever. He had a water slide that dumped straight into the pool. Best. toy. ever. (And in hindsight, my mom probably agrees because I’m sure I wore myself out running around and around sliding down that thing!) To this day, I still love waterparks. What can I say? I’m still just a big kid at heart! Ah, but back to summer! 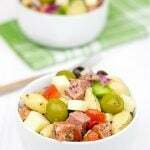 Is there anything more refreshing that a cold pasta salad on a hot day? I think my wife and I have enough favorite summer pasta salads to make one every week and not get through them all by the end of the season. 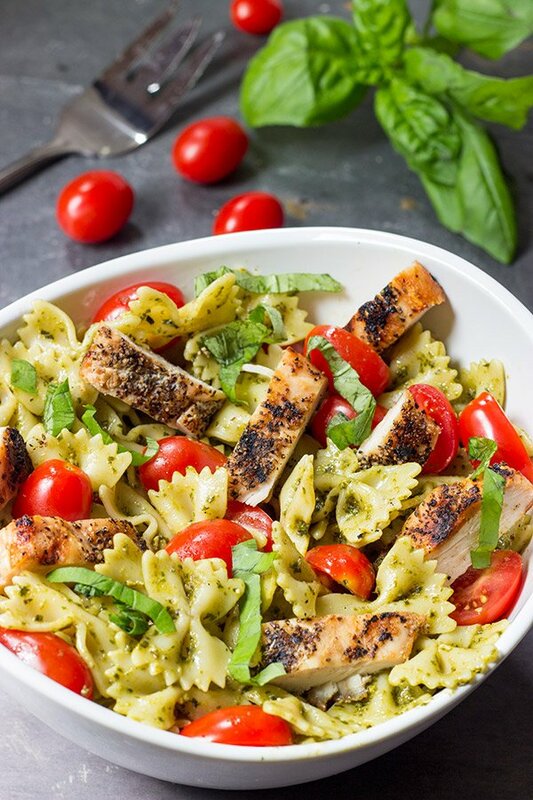 One of our favorites is this Pesto Pasta Salad with Grilled Chicken. 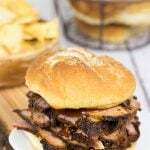 It’s quick and easy, and it has an incredible depth of flavor! Every summer, I plant several basil plants in our garden. I’ll occasionally pick off leaves for various recipes and meals, and then at the end of the summer, I’ll pull off all of the remaining leaves and make a gigantic batch of pesto. I then freeze the pesto in little cubes and store them in a big bag in the freezer. Check out my recipe for these Basil Pesto bombs. 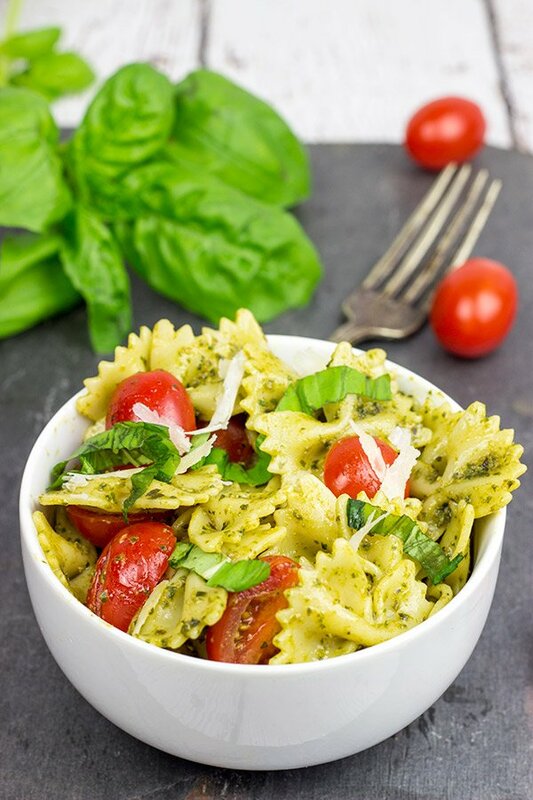 Those little pesto bombs come in handy year-round…like for this Pesto Pasta Salad! Speaking of year-round, this Pesto Pasta Salad is a great recipe no matter what time of the year it is. We serve it cold as a great summer salad and hot as a delicious winter dinner. Enjoy! Grill the chicken over medium-high heat for 5-7 minutes per side, or until completely cooked. 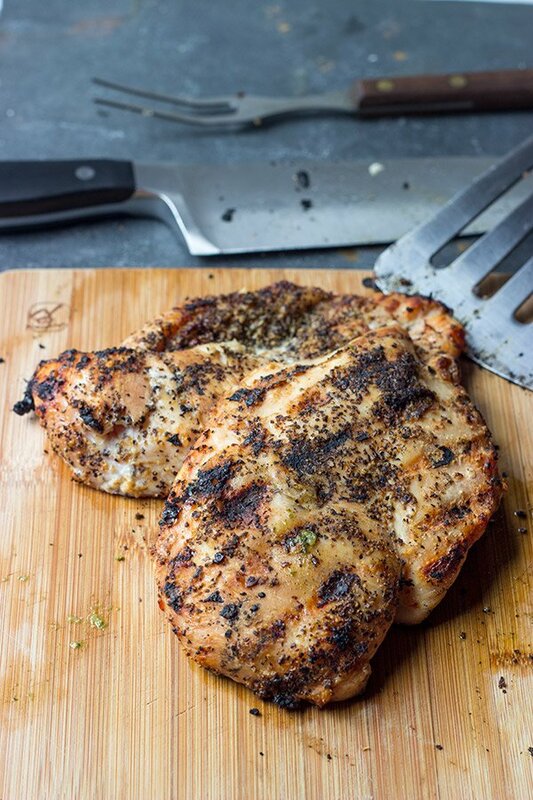 Transfer chicken to a cutting board and slice into strips. Using a large bowl, mix together the pesto, pasta and chicken. Stir until well combined and place in the refrigerator until chilled. Stir in the cherry tomatoes and fresh basil immediately before serving. Finish with freshly grated Parmesan cheese (optional). We often make this exact recipe in the winter, but we serve it hot instead. It works great both ways! A pool with a water slide is arguing the best way to keep kids entertained for hours (or adults for that matter). You were one lucky kid David to have an uncle like that! Thanks, Mike…what I wouldn’t give to have a pool with a water slide out back right now. Heck, even a slip-and-slide would be ok by me! I just made this dish last night David, but I cut everything in half because it is just me. Was delicious. I am trying to make some big lifestyle changes and this helped me a lot to keep on track. Did not make me feel deprived. Is there a place that there is the nutritional info? I have been doing a website that is called my fitness pal. It has you enter in all the food you ate through out the day and then it calculates how many calories you have left to eat for the day. I want to enter this recipe, but it needs to have the nutritional facts. As far as the nutrition info, we’ve simply been googling each ingredient and then calculating the calories based on the amount of each ingredient. I have run across my fitness pal, but I haven’t used them myself…so I can’t say much there. However, Laura (my wife) and I have been using an app on our phones called LoseIt. It sounds similar in that you add in meals/snacks/exercise/etc and it calculates how much you have left in the day. I’d say that’s the one downside of cooking recipes yourself…you’ve got to calculate the nutrition on your own. But cooking yourself is WAY better than eating out or eating pre-made meals…so hang in there! Thanks again, and good luck in your journey! So you are gonna want to throw this pasta salad at me – but I was a weird kid and I loved school – I counted the days to go back after summer break!!! When I was 8, we lived in Sri Lanka with the ocean all around and were at the beach every weekend (no slides and pools though). I could eat a whole chicken dipped in that pesto! YUM! *throws pasta salad at Shashi* Seriously, though…what kid WANTS to go back to school? Dork! Funny thing is that I now love learning. I wish I could just keep taking classes on all sorts of topics…without getting graded, of course. Hahahaha! Yup – I was a dork – in fact I might still have some dork inside me because that “whole chicken dipped in a vat of pesto” sounds like a fabulous post idea! your right this is such a perfect salad for summer.. and that chicken looks SO delicious. definitely could devour a bowl right now! Oh yes! My basil is going crazy in the backyard, Cindy. I keep picking off the flowers at the top hoping that it will keep growing. I’ve been picking leaves for this and that…but it’s almost time for the big pesto making day! Enjoy the summer break! This sounds like such a delicious and simple summer dish. Pesto on pasta is such a classic. Great recipe! Pasta salad is a required element of summer at our house, and yours looks amazing! I agree!! This is the perfect summer salad. I love the grilled chicken, the wonderful pesto and everything! This was AMAZING! Next time I will add more fresh basil however. Wow, that grilled chicken looks fantastic! Simple and delicious, bravo! Served this warm but will also try chilled. Leftovers were great too. Thanks for sharing! Thank you so much for coming back and commenting, April! I’m not sure if I like this dish hot or cold better…both are excellent. 🙂 I appreciate your comment, and I hope you have an awesome weekend! I made this for dinner and it was absolutely delicious! It will definitely be a meal I make again. It was very simple and quick to make. Thanks for sharing this recipe. Hey there, Josh! So I don’t typically calculate calories in my recipes as I find the calorie counters out there just aren’t very reliable. (They vary quite a bit depending on which one you use…which is pretty surprising.) But in general this recipe is healthy since it just uses grilled chicken. You do have to keep an eye on how much pasta you serve it with, though. And the pesto is a bit calorie-intense, too, but you don’t need that much pesto when it toss it with the pasta before serving. A little bit goes a long way! I hope this answers your question…thanks so much for leaving a comment! Cheers! Hey Marie! As I noted in the comment above, I don’t typically calculate calories in my recipes as I find the calorie counters out there just aren’t very reliable. (They vary quite a bit depending on which one you use…which is pretty surprising.) But in general this recipe is healthy since it just uses grilled chicken. You do have to keep an eye on how much pasta you serve it with, though. And the pesto is a bit calorie-intense, too, but you don’t need that much pesto when it toss it with the pasta before serving. A little bit goes a long way! I hope this answers your question…thanks so much for leaving a comment! Cheers!